The Christmas season is an exciting time for mail. Instead of the usual bills and solicitations (though there are plenty of those), each day’s post brings cards from friends, and my guilty pleasure — Christmas catalogs. 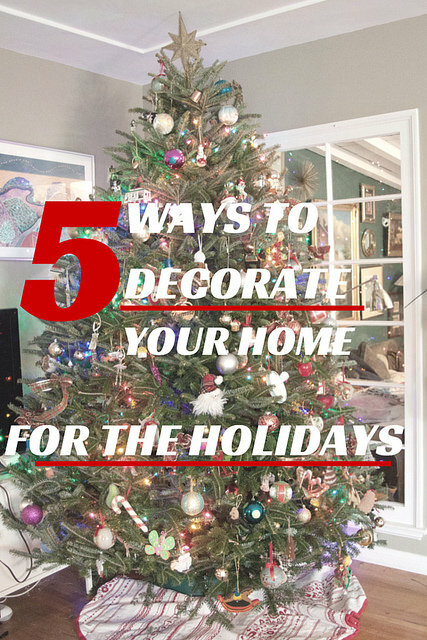 I love poring over each one, looking at the Christmas decorations and the Christmas food. Oh the food. I imagine a life where I’m ordering a $200 beef roast and $40 biscuits for Christmas dinner. And then I laugh and recycle the catalogs because WHO BUYS THIS STUFF? 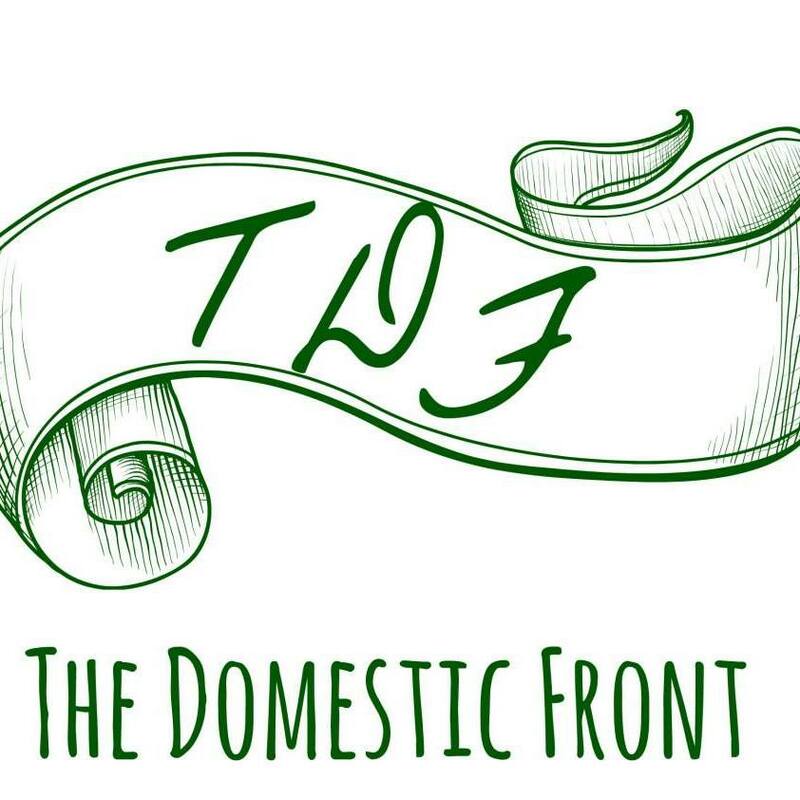 When you can make it yourself (and make it better) for less money? 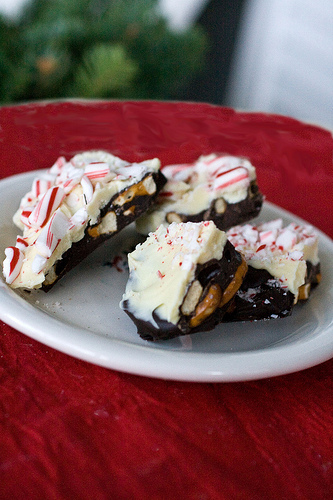 Take peppermint bark. I don’t know who invented it, but for a mere $27 (plus shipping) you can buy it for a loved one for Christmas. Or, for the price of a few ingredients and literally two minutes of your time, you can make it yourself. And you can add pretzels, which elevate your standard, run of the mill pepppermint bark to a whole new level of salty sweet goodness. You can’t believe how easy this is. Microwave a package of chocolate chips for about a minute, stirring every 15-20 seconds. 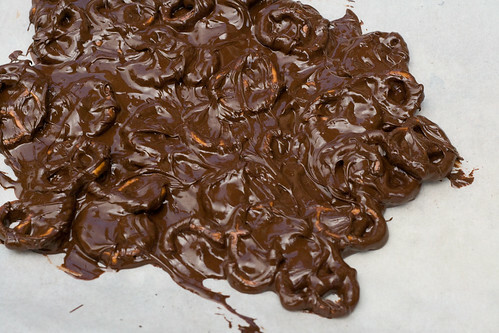 Mix in a handful of pretzels, spread onto a baking sheet, and pop in the freezer. About 15 minutes later, microwave a package of white chocolate chips, same method. Spread it on top of the hardened pretzel chocolate mixture. Stick a few candy canes in a ziploc bag, whack them a few times with a rolling pin to break them up, sprinkle over the white chocolate, and let the whole thing harden. THAT’S IT. No baking, no candy thermometers. You saved $27 and added some pretzel goodness to boot. Merry Christmas, says I. Go forth and cook. In a microwave proof bowl, microwave the chocolate chips for 30 seconds, stir, and then microwave in 15 second intervals, stirring between each bout, until the chips are melted. Mix in pretzels, spread as thinly as possible onto a baking sheet lined with parchment and pop in the freezer for 15-30 minutes or until firm. Repeat the microwaving process with the white chocolate chips. 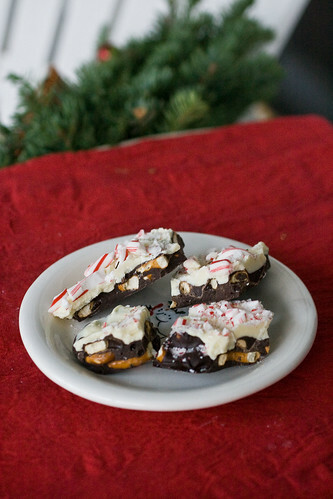 Quickly spread the white chocolate on top of the hardened chocolate pretzel mixture, and sprinkle candy canes on top. Let cool until firm, and using a sharp knife, break into pieces. hee hee – i might be someone who would buy those biscuits. 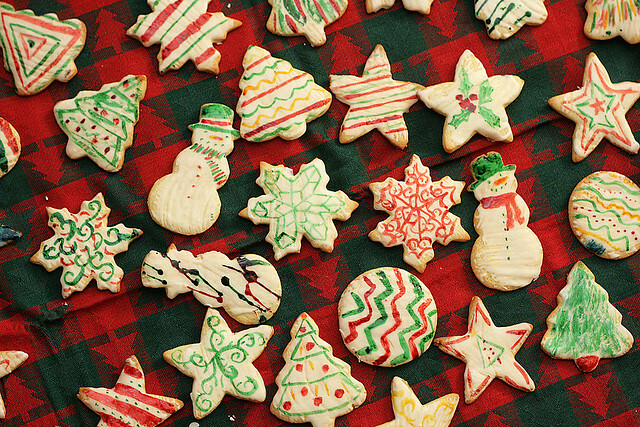 not for myself, but for someone else as a gift – so i could try them too. 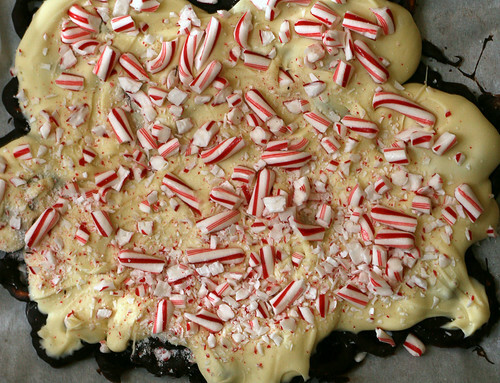 this peppermint bark looks particularly yummy. it’s not candy cane season anymore for me, but you have convinced me to do this! A-mazing. I know Christmas is over but I don’t care. I am going to make this, maybe not peppermint to stay at least moderately seasonal to boring old January. Do you suppose there is the equivalent of hockey skate flavour that isn’t terrible? I am so happy I found you again! I made this bark for the last 2 years and lost the recipe! It is such a hit and soooooo easy! Thank you~ I will never lose it and now its a family tradition.